I taught myself how to knit at the beginning of this year and I was very excited to start knitting again this fall. I meant to start back in early September but just got around to it last week. I have no idea who this is scarf is for, but I saw this pattern in a magazine at the end of last winter and knew this would be the next project. Hopefully it will turn out well and be a nice Christmas gift for someone. It's proven much more difficult that I anticipated. I think I ended up starting over 2 or 3 times after knitting the first 12 rows or so because I kept messing up. Are you a knitter? 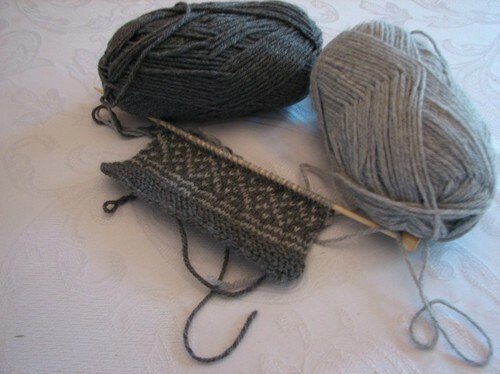 Are you knitting gifts for anyone this Christmas? Ha ha. Please don't hate me! If it helps, I did struggle a bit keeping every thing straight and it isn't perfect. I am excited about my next project - a toddler hat - stay tuned! This page contains a single entry by Erin published on November 9, 2010 10:30 PM. Monday Five Countdown was the previous entry in this blog. My Most Used/Favorite FREE Android Apps is the next entry in this blog.